and time-of-day to maximize call-to-action or response. Location Based Services provided by ProTexting is a gateway directly connected to Tier 1 wireless carrier networks and allows is to obtain mobile subscriber location data in real-time. Our gateway is certified by the top wireless carriers including AT&T, Verizon, Sprint, T-Mobile, Rogers and more, giving you the ability to locate up to 280 million subscribers in the United States. Under ProTexting's privacy-protected, permission-based Location Marketing, clients can determine a customer’s mobile device location—all privacy-protected and permission-based. By comparing device location to your business location, you can deliver hyper-local messages and promotions. You can know when your customer is right across the street, or in front of your door. Because you are connected directly to the carrier location networks via our LBS gateway, you are accessing network location, not application location. That’s why mobile location passes the critical requirements of large brands and retailers. Because there is no app to download, ProTexting can deliver to you location coordinates for all of your mobile customers... smartphones, feature phones, connected devices, even SIM cards...any device on the carrier’s wireless network can be located via our location based gateway. ProTexting's LBS gateway gives you the reach required to enable mobile location to work for all of your customers—whether they carry a smartphone or not. You know how difficult it is for your customer to download your branded apps on their iPhone or Android—you are happy with reaching 5% of your total customer base. But with Locaid, you can locate all of your customers, regardless of their device. No app to download, no customer action or click-through required. Once they have opted in to receive your location-based messages, you are good to go. That’s why brands ranging from Starbucks to The North Face utilize network location as a marketing practice. 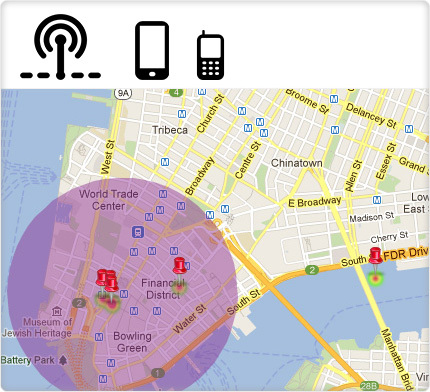 Only carrier-based location gives you 100% customer location coverage. Loyalty Offer – Provide incentives to loyal customers when you know they are in your stores. Direct them to special sale items that are of particular interest to them. Store Proximity - Encourage customers to visit when they are close to your stores. Provide customers with incentive to visit your stores while they are in competitor’s stores. Local Promotion - Make special offers to your customers who are attending a specific public event (i.e., concerts, sporting events) at a specific time and at a specific location. ProTexting has streamlined the location-enablement process with our single platform, single API, and single point of contact. Since we handle the relationships with large wireless characters—and all the time-consuming requirements that come with those relationships—your time to market is significantly reduced. Drive Store Traffic - By comparing a store location with your customer’s device location, retailers, consumer goods companies and agencies can deliver location-specific offers. Increase Campaign ROI - Mobile location data gives retailers added insight needed to develop and launch more effective marketing. Deliver Hyper-Local Content - ProTexting allows you to send the right offer to the right customer when they are in the right place. Proximity Marketing – ProTexting allows you to establish geo-fences around business establishments to notify customers of offers and services when they are around the corner. 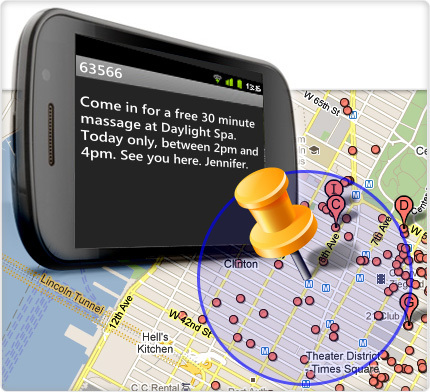 Real-time Alerts - Want to reach out to your loyal customers when they walk in front of your store? ProTexting's platform allows you to do just that.